About 6 months ago, Peter Edgar, the CEO at Investx, sent me an early draft of his White Paper to seek my thoughts. He knew me as a fairly traditional, conservative (big c and little c) soul, who had worked in large banks since university and had a, shall we say, reluctant attitude to technology. However, he had an idea which, using blockchain technology, would solve some of the issues inherent in the SME funding market and wanted a view from someone with real life experience of the SME banking and private equity worlds. As a man who hadn’t owned a personal mobile telephone for about 10 years (I had a work Blackberry — not exactly a smart phone) and once went a couple of months without a phone at all (imagine that, millennials! ), I would hardly describe myself as a tech guru, so blockchain was a real step into the unknown. My passion for technology harks back to an earlier era when Britain was revolutionising the world with steam trains and Victorian engineering. However, Peter had the idea to launch an equity crowdfunding platform for established SME’s, built using blockchain technology and involving the issue of a cryptocurrency. Leaving aside the blockchain / crypto piece for a while (you’ll have to wait for Part Two), the business model appeared to me to be fairly simple in its most basic form. The idea of individuals clubbing together to fund investment has been around for hundreds of years and has proven to be successful, funding countless projects which wouldn’t have got off the ground had it been left to governments or wealthy individuals. And over 14 years in banking, having reviewed hundreds of lending applications, the number of times I’d been sat in a client meeting with a good business looking for growth capital, but having to say “it’s too small for our policy”, “we’ll need personal guarantees” or “you need equity for this” were countless. So, a simple business model, addressing a gap in the market and using new technology. Sounds good so far. I started reading the White Paper on a train from Manchester to Liverpool, which in hindsight was quite appropriate. For those of you who don’t know, the train line from Manchester to Liverpool was pretty significant in the world of technology. Why was this train line so important? First, a bit of context. Manchester had become a leading light in the industrial revolution, with cotton mills supporting the rapid expansion of the British Empire. However, getting the raw materials in and the finished goods out was a slow, laborious process which relied on animal transport and a network of canals. Following the success of the Stockton and Darlington railway (the first public railway), a competition was held to create a railway line which would significantly reduce the cost of transporting raw materials, finished goods and people between the Port of Liverpool and the cotton mills of Manchester. There were however a number of challenges, including vested interests trying to prevent the new technology (in the form of the canal owners) and fear of the new technology from the general public (people thought that they would stop breathing if they travelled too quickly). Sound familiar? In spite of this, two remarkable things were achieved, thanks to the efforts of pioneers, early adopters and, some very bright people. 1. The first passenger train line in the world. Today’s line still follows the same route which is no mean feat when you consider it was built in 1830 across bogs, over viaducts and through tunnels. 2. 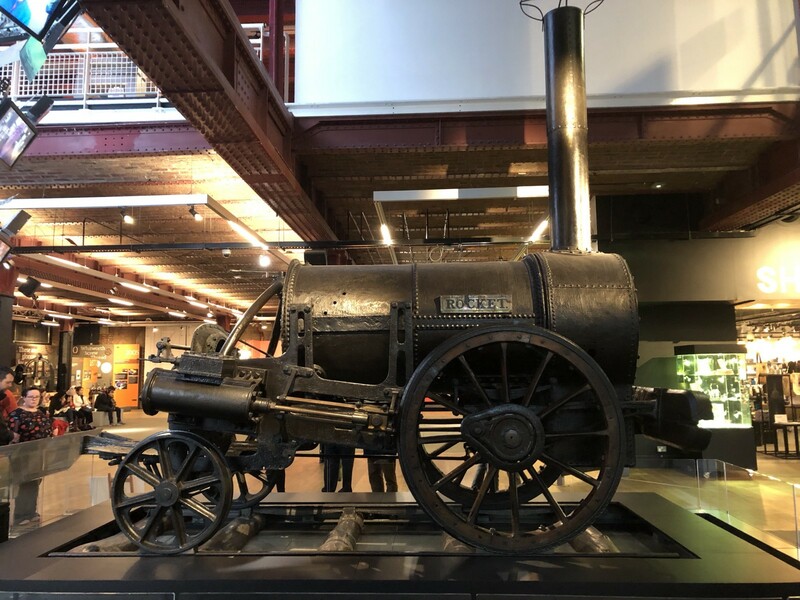 Following the Rainhill Trials (conducted in 1829), George and Robert Stephenson’s “Rocket” was considered the most suitable means of locomotion to drive the passenger trains that would operate on the line. This was the technological template for all steam trains that followed. Oh, by the way, it was crowdfunded as well. - For George and Robert Stephenson’s Rocket — think Satoshi Nakamoto and Bitcoin. - For the resistance to new technology from vested interests — think banks and regulators. - For public fear and lack of understanding — think public fear and lack of understanding (!). - For the long-term benefits of railways (188 years of service and counting) — think of the potential of blockchain. So, despite being a late adopter to technology, despite still learning about blockchain technology, I can see the potential. And I can see why Investx have chosen to use blockchain technology to crowdfund SME equity investment. Join me in Part Two when I share my journey through the terminology of the new technology. No more steam trains though. If you want to join our journey, our pre-sale ICO launched on 1st November — download our Litepaper, Whitepaper and Currency paper. Experienced Private Equity and Corporate Finance Banker, adapting to the new world of FinTech!